What’s better than a puzzle game with Marvel characters? One that has an awesome gameplay engine like D3 Publisher’s “Puzzle Quest” and features the storyline from the classic Marvel Dark Reign run. With tons of characters awesome abilities and easily over a hundred levels, this is simply one of the best takes on the “Puzzle Quest” formula yet. Although we’re only a handful of hours into the game, the comic book-inspired story, bevy of cool characters and abilities make the match three puzzle game more than the sum of its parts. Those that have played this game on Android and iOS remember it as addictive, but not being bound by the limitations of the mobile game, “Marvel Puzzle Quest: Dark Reign” will immediately harken many older gamers to the series on the Xbox 360. Just as immersive, but with a better story, it’s the type of game you can invest a few minutes in if you need a quick fix, but also something you can spend hours with. It also helps that the game has top shelf art. While the animations for special attacks are solid as well, it’s those character cut-outs and comic book covers that add an extra level to the eye candy. Overall, with tried and true gameplay, the visuals aren’t the most important element, but it’s a nice touch and it’s something that shows D3 and Marvel worked extremely closely on this title. 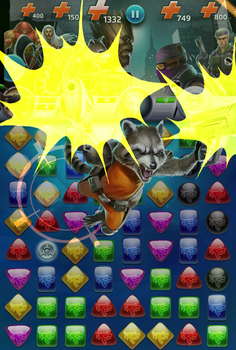 Through our initial gameplay, it’s fair to say that “Marvel Puzzle Quest: Dark Reign” is an incredibly deep puzzle game that can and will steal hours of your time.